I love a good hamburger every now and then. However, ground turkey seems to be a staple in my house. It’s budget friendly, can be very lean, and really lets the flavor of the ingredients it’s mixed with shine. 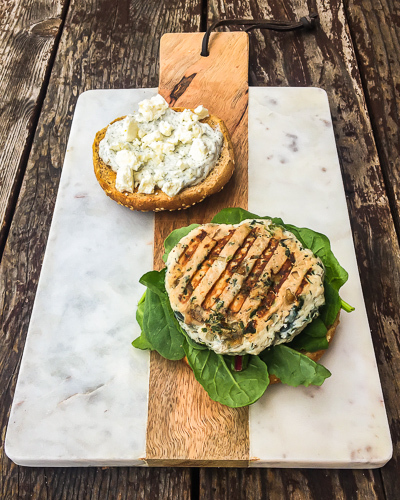 That’s why I came up with this delicious greek turkey burger. The fresh dill, purple onion, and tangy tzatziki sauce really turn a basic, bland turkey burger into a delicious flavor bomb! This whole meal is simple enough to throw together on a school night and have ready on the table in 30 minutes. Best of all, the recipe doubles very easily and can make leftover dinners and lunches a breeze. To get started, I washed & cut up all the vegetables. 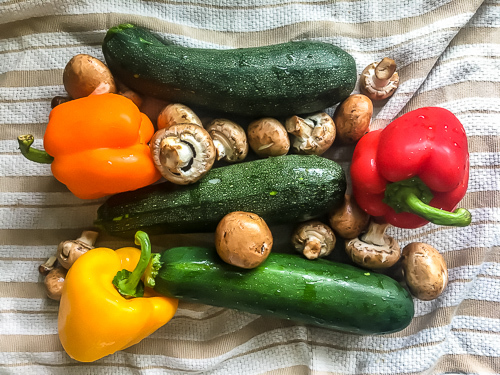 For faster prep, just leave the mushrooms whole, cut the peppers into quarters, and cut the zucchini into 1/4 inch coins, cut on the bias. Once the veggies are chopped & sliced, toss them with oil, salt and pepper. I always use liquid coconut or avocado oil for grilling as these types of oils don't break down and lose their nutritious properties at high heat. Next I prepared the tzatziki so it would be ready and cool once the burgers and veggies come off the grill. This is one of the easiest, most versatile and tasty condiments I can think of. It also packs an extra dose of protein with the Greek yogurt. Tzatziki is my jam…not literally, but I can think of so many meals and snacks I use this sauce with. Try it as a dip with veggie crudité, paired with some lox and hard boiled egg, spread on sandwiches or wraps, substitute for mayo in a tuna salad or deviled eggs, topping for baked salmon, as a salad dressing...I could keep going here, but I'll spare you. If you really want to know more, you know how to find me. And now a little nutrition tidbit: As you can see in the picture, I use fat free Greek yogurt. This is strategic, as I'm taking into consideration the oil I'm adding to the tzatziki, oil for grilling and cooking the vegetables and burgers, the 7% fat in the ground turkey I'm using (because nobody likes a dry burger), and the full fat feta cheese I sprinkle on top. It's all about balance. 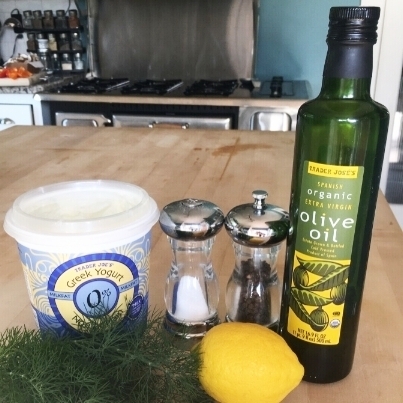 If you love the thick, creaminess of full fat Greek yogurt and want to keep the amount of fat in your meal in check, consider skipping the added olive oil in the tzatziki, reducing the amount of oil used in the other steps, or using 99% lean ground turkey. You can also make no changes at all and just let your full fat flag fly! There’s nothing wrong with fat, I just know for my health goals that a moderate fat intake helps me keep things in check. Okay, back to business. To make the burger patties, I chopped the purple onion and added it to a sauté pan. I cooked the onion until is was just fragrant and then added the spinach. Once the spinach and onion mix cooled a bit, I combined it with the rest of the turkey burger ingredients in a large mixing bowl. I used frozen, chopped spinach this time as I didn't have fresh spinach in the house. If you use fresh spinach, cook it just long enough to wilt. Honestly though, I always have frozen chopped spinach in my house because it is my super easy go-to for blending veggies into my smoothies. A note on frozen produce: Do you know fresh and frozen produce are about equal when it comes to nutrition content? Frozen fruits and veggies don't suffer at all in the nutrition department from being frozen. In fact, they can offer even higher nutrient value than the "fresh" options at our grocery stores. Frozen produce is picked at peak ripeness, when nutrient content is highest, processed (i.e. washed, peeled, chopped to make ready to eat) and frozen, retaining all those wonderful vitamins, minerals, antioxidants and phytonutrients. Many fruits and vegetables we buy at the grocery store are picked prior to peak ripeness, artificially ripened with gases while they are shipped hundreds or thousands of miles from their source to their destination - our plate. Do you love fresh herbs as much as I do? Fresh herbs may be my favorite addition to any dish. I'm kind of obsessed with them and all the different combinations you can play with. They add so much flavor and dimension to foods, and are an especially cheap ingredient if you grow your own! I do not have the greenest thumb, but I've managed to keep these babies alive for several months now! 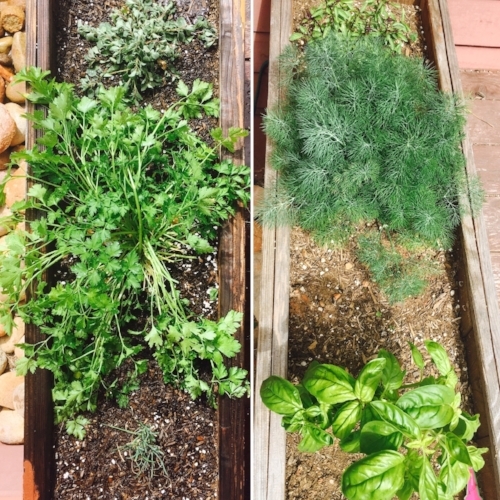 You can spot the fresh dill I used in this recipe in the planter on the right in the middle. There is a LOT of it. You don't need an outdoor garden to grow herbs. Try planting some in a pots and keeping them in sunny spots in your house for easy use. Once all the burger ingredients were together in a bowl, I gently mixed them together with my (clean) hands, formed them into burger patties, and seasoned both sides with a little more salt and pepper. I find the easiest way to make burger patties is by forming a compact ball of the meat mixture with both hands, then sandwiching it between your palms into a patty of even thickness. Try not to leave the patties too rounded in the middle as they'll take longer to cook, leave the edges dried out and tough, and be more difficult to eat...especially if you're using a bun. You can leave the veggies on the grill for less time if you like a little crunch in your peppers and zucchini. If you like the veggies a little more well done, put them on the grill 5-10 minutes before the burgers and leave them on while the burgers cook. A note on grilling: I am that girl who doesn’t do the grilling. My husband is the grill master in our house. Someday, that might change, but in the meantime, when I need to grill things myself, I use my magical Cuisinart Griddler (pictured in the video for this recipe). This thing is amazing. It cooks everything evenly, gives those beautiful grill markings, nothing sticks, and the plates can just be tossed in the dishwasher when I’m done with them. Yes. Please. In the video for this recipe, you’ll see I use the Griddler for both the veggies and the burgers. Since you don’t have as much square footage on the Griddler as a full size grill, you’ll have to cook things in a few batches, but I found this helpful as it gave me a few extra minutes to clean up the kitchen and set the table so everything was ready to go by the time the food was cooked. Here's the finished product: sweet, sweet protein...and lots of it left over for lunches and dinners this week and beyond! 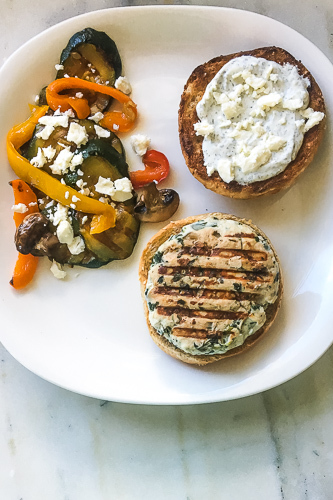 I plated the burgers on a toasted whole grain bun and topped the burger with a healthy dose of Tzatziki, and crumbled feta, served with a side of grilled vegetables! As you can see, my vegetables were cooked for a shorter time period, so they don't have much browning. I like a little crunch with my cooked vegetables. Whole or sprouted grain burger buns if desired. I love and recommend Ezekiel 4:9 buns: http://bit.ly/1UtBSn0. A bed of greens will also do if you're not wanting a bun. NOTE: If you do not have a grill basket or pan to place vegetables in on grill, cut peppers into quarters and leave mushrooms whole so they do not fall between grill grates. You can also swap out any of these vegetables for your favorite, grill-suitable types of vegetable. For grilled vegetables: Combine sliced vegetables in a large bowl and toss with melted coconut oil, salt and pepper. Set aside until burgers are ready to put on grill. For Tzatziki: Combine all ingredients in a medium bowl. Cover and refrigerate until ready to serve. In a large sauté pan, melt coconut oil. When oil is melted, add chopped purple onion and sauté for 2-3 minutes, until fragrant. Add the spinach to sauté pan with onions and cook 1-2 minutes or until just wilted. Remove spinach from pan and add to large bowl with ground turkey, chopped fresh dill, and pepper. Mix together all ingredients until well incorporated and form into 6 patties. Season both sides of burgers with a bit of salt and pepper. Preheat grill and grill veggies and burgers until cooked through. Burgers should take about 5 minutes per side depending on how thick you made them. If desired, insert a meat thermometer or knife into the middle of a burger to check for doneness. I always double the tzatziki recipe when I make it...I put it on pretty much everything. It’s a great tip for veggies & so tasty on other meats and fish dishes. Who doesn't like grilled veggies in the fridge ready to eat at a moments notice? Depending on your situation, I guess I'm pretty much recommending you double the whole thing! I double this whole recipe every time so I have back up when I need a good meal and I don't have time to cook. Also...my husband is a big guy and eats A LOT. 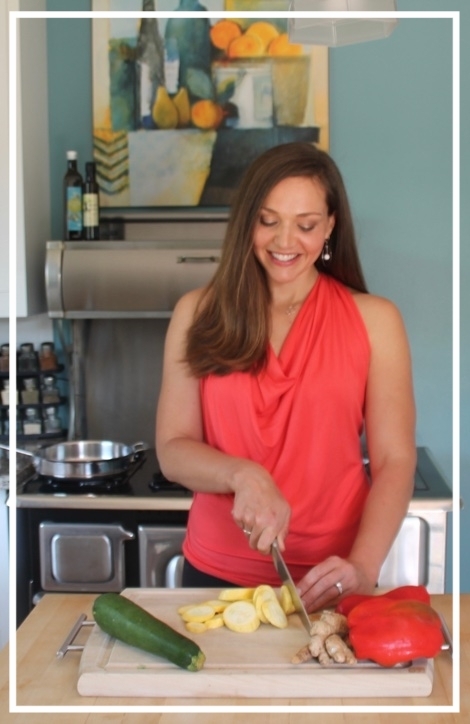 If you have any questions about this recipe or how to prepare nutritious meals to have ready for your family, take to work for lunch, or save you time in the kitchen during the week, don't hesitate to reach out to me! Follow me on Facebook and Instagram for regular meal, snack, and life inspirations: @jeannereillyrd. *Disclosure – This post contains Amazon affiliate links. We are a participant in the Amazon Services LLC Associates Program, an affiliate advertising program designed to provide a means for us to earn fees by linking to Amazon.com and affiliated sites.